The Bachelor of Information Systems program is jointly delivered by the University of Tasmania and the Shanghai Ocean University. To ensure content relevance and improved student engagement the teaching team has developed an innovative combination of technology placement and teaching pedagogy. The innovative interventions to real contractual and resource constraints presented in the delivery of the program focussed on engaging students, aligned use of technology and creating a quality learning experience amongst students that were studying offshore. 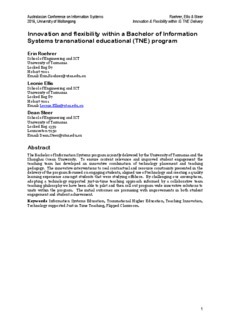 By challenging our assumptions, adopting a technology supported just-in-time teaching approach informed by a collaborative team teaching philosophy we have been able to pilot and then roll out program wide innovative solutions to units within the program. The initial outcomes are promising with improvements in both student engagement and student achievement.